​4” braided steel to loop around the wheels (vinyl coated for smooth use). ​You can lock both wheels (front wheel with cable and back wheel with U portion of the lock). ​The U portion should have been longer because it becomes a bit daunting to lock bigger tires. ​The mount bracket is made up of plastic and is not very durable. ​The cable isn’t long enough. You can lock the front wheel, bike frame and the back wheel as well using the cable and the U portion of the lock. Unlike other locks, this one works on a double lock, which offers double security. Even if somehow a thief cuts one end of the lock, the other one can still keep the bike secured. If we compare previous models of Onguard locks to this one, it has a shackle thickness advantage. The 13mm steel shackle is hard to break or cut. The security rating given to the lock is 65, which is better than most products from the makers. ​Bike lovers can lose their minds if their bikes get stolen. Sometimes, even a high security rating lock can fool you and can easily be picked or cut using picking tools or a heavy bolt cutter. The OnGuard Bulldog DT 8012 ensures utmost safety for your bikes as it has a double lock system (both ends of the shackle can be locked), and a highly durable shackle with high-grade cable. When it comes to tampering with bike locks, it’s much easier to cut a lock that has a single side locking system. A thief can just cut one side with a bolt cutter and the lock would come apart. However, this is not the case with DT 8012 because it works on two locks simultaneously and is hence much more difficult to tamper with. 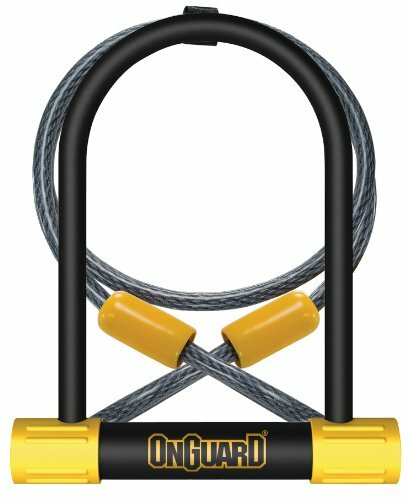 ​The OnGuard Bulldog DT 8012 is a bike lock with a sturdy and durable frame that keeps your bike secured whether you park it somewhere on the road along a post or store it in a garage. With a security rating of 65, it is much more capable than other locks on the market thanks to the hard steel shackle (13mm) which is not easy to break. With it, you can lock both tires as well as the bike frame. The front tire is locked with the cable and the frame plus back wheel is locked up using the U-portion of the lock. This way, your bike is secured. ​Bike enthusiasts who want to secure their bikes from getting stolen should turn to this lock. It has a two-end locking system, lock keys that can’t be duplicated easily, and a very strong body frame that can’t be taken apart with tools. The shackle is made up of hard steel that is meant to resist high-end jacking, pulling and prying. So, bike owners who have had their bikes stolen in the past along with the lock should definitely try this lock as it does what it says. ​When you buy the product you get the OnGuard Bulldog DT 8012 U lock, 5 keys (1 large key with LED Feature), instruction manual that explains how to use the lock and adjust it, and some screws and brackets to attach a mount to your bike. However, the mount brackets are composed of plastic and are not that handy. There are many bike locks on the market that claim to be unbreakable, but they really aren’t. A major reason for locks to be easily broken is because the lock doesn’t apply on both ends on the crossbar. This is what makes it easier for thieves to neutralize the lock by cutting through only one end of the shackle and the entire lock would come apart. Now, let’s get to the OnGuard Bulldog DT 8012. It works on a double bolt mechanism. This way both sides of the shackle are locked in tight with the crossbone. Hence, a thief has to break both sides of the lock to be able to steal the bike which is quite difficult considering the width of the shackle. What good is a lock if the keys can be duplicated or key slot is exploited? Worry not, because with DT 8012 you get to have a lock system that works with Z-CYL technology. It is designed to prevent pick protection as the key lock system works on patent pending Bump Lock technology which makes bump keys useless. Other than that, the key lock system is enclosed inside the hard steel shackle so as to prevent forced pulling or drilling with tools. ​The lock weights 3.1 pounds, which makes it quite easy to carry as you attach it to your bike. The mount it comes with is easy to install as well, which makes it easy to carry the lock around. ​The Company has so much faith in its products that it offers you insurance in case your bike gets lost despite the lock. You only have to register for this insurance to avail it. ​The 4” x 0.39” cable is coated with vinyl material to produce extra smoothness so that the lock can loop around the wheel easily. If you love your bike and want to make sure that no one steals it away from you then go for The Onguard Bulldog DT 8012. It’s worth the money and will give you peace of mind no matter where you park your bike. Plus, it’s very easy to use and carry and even looks good on your bike. ​Personally I like the lock very much. Especially the dual lock ​mechanism system. & I have already used it ​for almost 3 months. You can ​definitely give it a go.